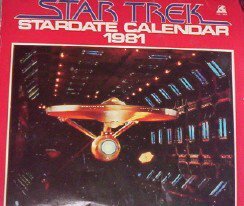 John Kenneth Muir's Reflections on Cult Movies and Classic TV: RETRO TOY FLASHBACK # 29: Star Trek Calendars! 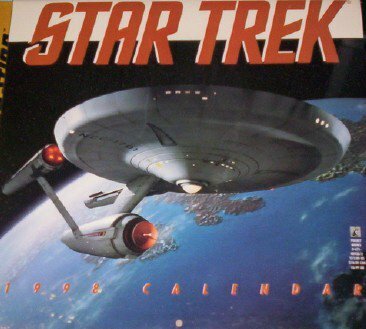 I started early collecting my feature of the week: Star Trek-related calendars. 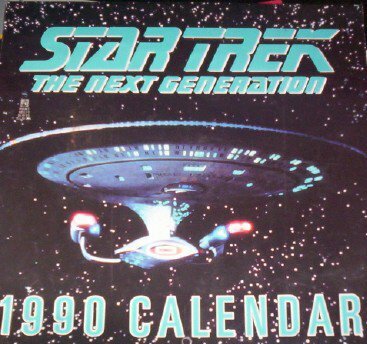 Actually, my very first calendar (not pictured) was a Star Wars calendar from the year 1977. I'll never forget it...I really loved it and made it a special point to look at it every day. It hung on my bedroom closet door long after 1977, of that you can be sure. But for Christmas of 1980, my parents surprised with me with a great gift (among many great gifts): two different Star Trek: The Motion Picture calendars for the year (or stardate...) 1981. What I loved about these calendars is that many of the stills you could see on the individual month pages featured scenes not actually in the movie. 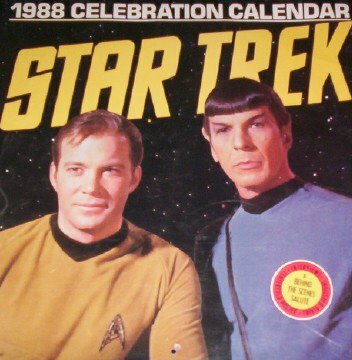 For instance, in one calendar, you can view Mr. Spock and Captain Kirk inside V'Ger, wearing orange and red spacesuits of a totally different style from the ones they adorn in the film. That fascinated me as a kid...and it still does. I don't know that I had much real practical use for calendars, however, until I went away to college at the University of Richmond in the fall 1988. 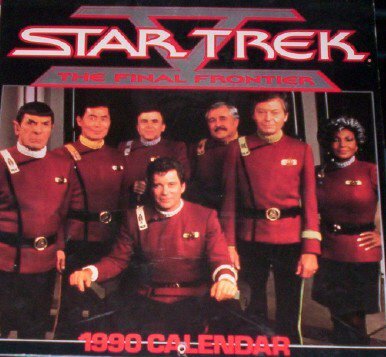 Now, suddenly, I had to keep track of things like bills, parental visits, finals, mid-terms, paper due-dates and the like, and so my penchant for Star Trek calendars came in handy. Back in 1988, I was also staunch defender of Star Trek: The Next Generation so I owned a calendar from that show for my freshman year. These days my love for TNG is not so much. But once upon a time, I even had all the episode titles memorized, in order (let me see how I do...Encounter At Farpoint, The Naked Now, Code of Honor, The Last Outpost, Where No One Has Gone Before, Haven, Justice, The Battle...). At one point, I know could rattle off 37 titles in a row, almost two seasons. Yeah, that's why I didn't do too well in my classes, I guess. I was always trying to remember if that episode with the Bynars was called 11001001 or 100110011. All right, whatever. That sequel came with The Undiscovered Country in 1991 (my favorite Star Trek movie...) and I remember that year well because it was the year the world lost the Great Bird of the Galaxy, Gene Roddenberry too. I still have this calendar as well. 1994 heralded the end of The Next Generation. 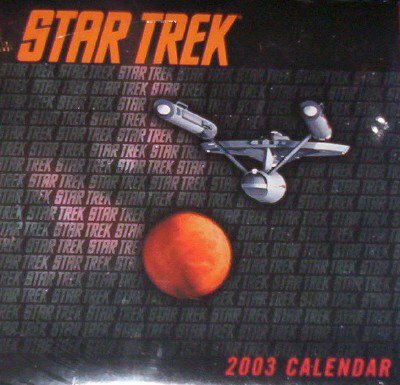 Over the years, I kept buying more Star Trek calendars, but ultimately used them less. Through the remainder of the 1990s, many of the calendars I got didn't even come out of their plastic and that's how I still have them today...sealed up tighter than Khan in suspended animation on the Botany Bay. 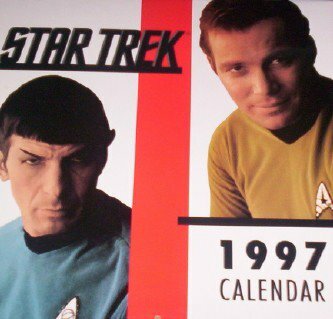 And today - if a calendar should feature Kirk, Spock or NCC-1701 on the cover...(or for that matter, Jolene Blalock...) I am so there! 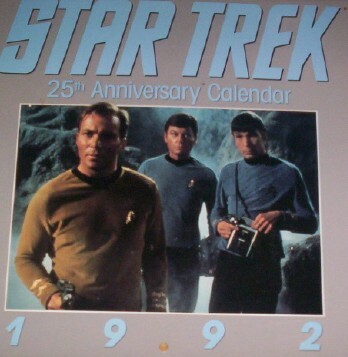 I am right there with you on the Star Trek calendars! 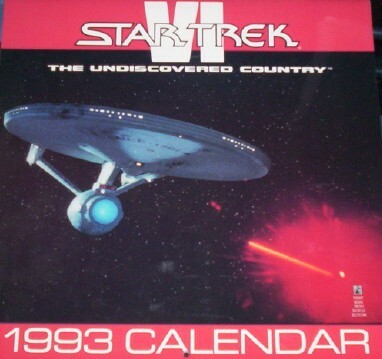 My first one was the 1984 Search for Spock calendar. I have all of the ones you pictured on your blog. The Undiscovered Country calendar has the only picture of Iman as Matia I could find so I got Iman to sign that picture when I met her. Mine are all open and most of the older ones are filled with marked dates for events that were special to me. I would block out conventions I was going to, target dates for saving money for the dealer's rooms, movies coming out I wanted to see, birthjdays of girls I liked at school, and historical dates that interested me. I still buy a Trek wall calendar every year. Since I started working I have also been buying the page-a-day desk calendars. Today has a great picture os Sisko from "Favor the Bold." 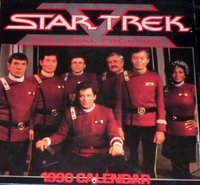 I miss the days when Star Trek was so popular that they would make a seperate calendar for every show. I have faith that we will be there again one day. By the way, set Next Gen aside for a little while and come back to it later. Try to remember how excited you were to see it each week when it was on the air. We were getting new Star Trek every week for the first time in years. It isn't the original series. Let's face it, nothing is. But it is still really good and has a good heart. Folks are hard on Next Gen now but I also have faith that if you come back to it in the future, you will remember why you liked it back when it was on. Thanks for sharing your memories of Star Trek calendars. I know I cherish mine too. I'm trying to open myself back up to Next Gen. I was a staunch defender when it first aired: I knew it would be seen in the shadow of the original series, and I thought it was important to see it on its own terms.